We enjoy getting away to Los Angeles for the weekend. My wife has family there and there are tons of things to do in LA. All we need to put together a great weekend is one good reason to go up there. 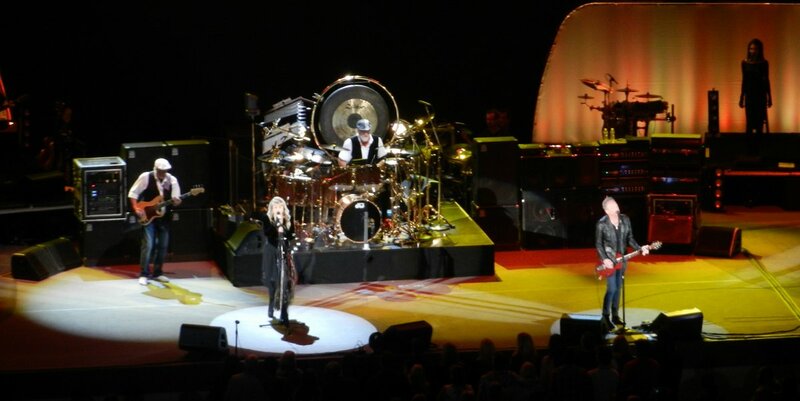 This time it happened to be Fleetwood Mac at the Hollywood Bowl. They are playing several places in Southern California, but we have a busy summer ahead and had conflicts for the other shows. 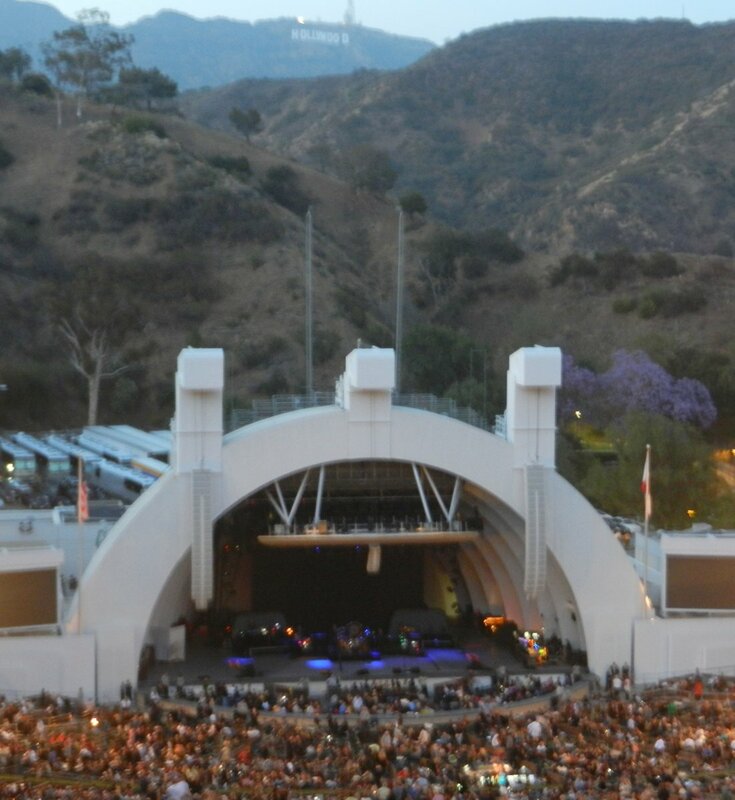 Also we have been wanting to go to a show in the Hollywood Bowl for quite a while. This was our chance. I will say that as good as I have been at getting pretty good seats to concerts over the last few years, this was an exception. The American Express presale just about sold the show out. It sold out quickly once the regular sale opened up. Note to self: Get an American Express before the next concert season opens up. I clicked buy tickets the moment the regular sale opened and the best seats were in the top section… way up there. We had a great time though. We got hotel rooms about 3 blocks from the Hollywood Bowl so we walked to and from the concert. I definitely recommend doing that if you get a chance. Didn’t have to worry about parking, or driving after the show. Even though the seats were not great we had a great time and the music was great. As usual my camera still managed to get a couple of fairly decent shots. This one is right before Fleetwood Mac took the stage. This photo was taken during one of their first songs. Like a place, music can quickly take me back to an earlier time and intensify my memories. This concert brought back a lot of good memories of my teenage years in the 70’s. Fleetwood Mac sounded great that night and the few videos I took captured the great sound, unfortunately I choose to sign along… I really cannot sing! When I’m singing I cannot hear how bad I am, but hearing these recordings confirmed for me that I should sing very quietly or lip synch! On Sunday morning we slept in and walked to Hollywood for a late breakfast at a famous diner… famous but since I don’t have anything good to say about it, I’ll leave out the name. The food was less than average – and we were very hungry. 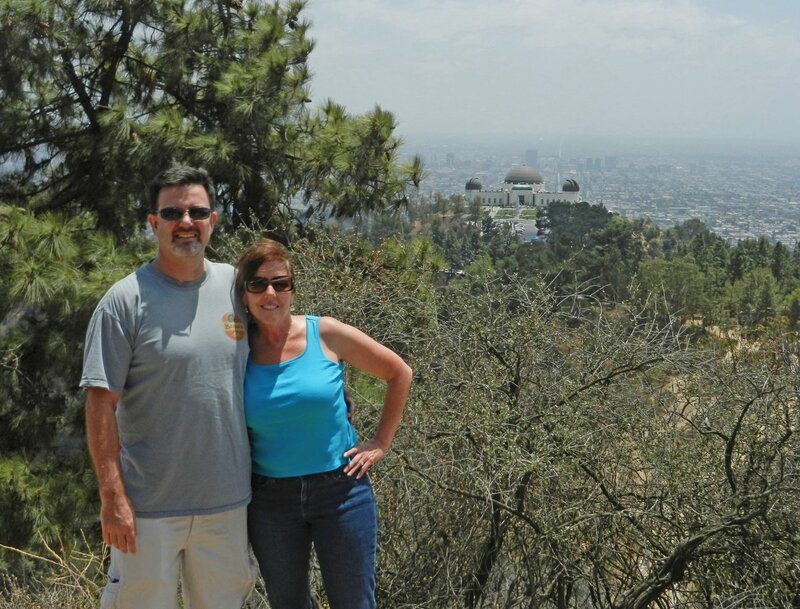 Then we packed up and headed out for a day of exploring in Griffith Park. Google Navigation took us on a round about course to the park entrance and then announced as we drove past the park on the 5 freeway that we had arrived. Another note to self… don’t search for a Park and put that in for Navigation directions, it will only get you close, not to an entrance. We were able to follow the signs from that point and got safely to the park. 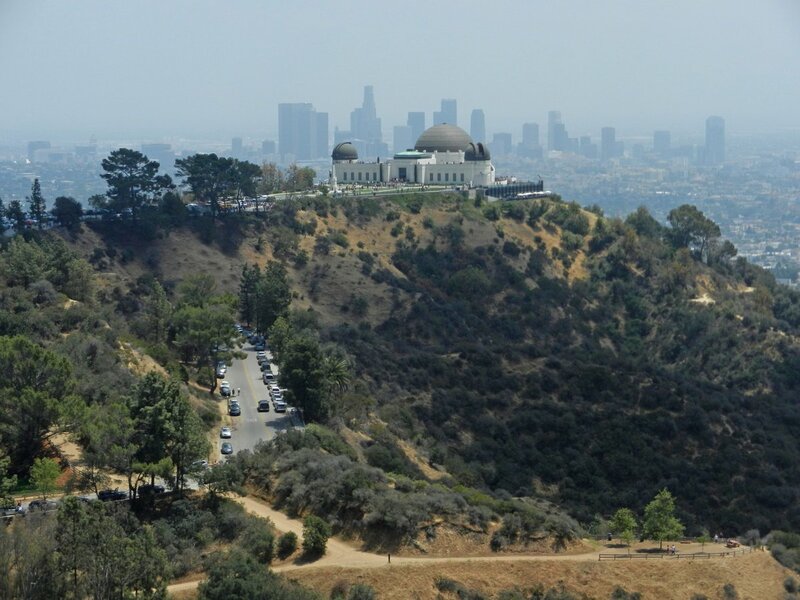 Griffith Park is large and there are tons of trails. I’ve done lots of hiking in Mission Trails Park in San Diego, but this is like that parks really big brother, and then throw in a Greek Theater and an Observatory. There was a lot of traffic in the park, but we planned to hike up to the Observatory anyway, so we found a parking spot near a trailhead that looked like it was heading the right direction and set out on our hike. The initial trail was very steep with almost no people, but once we climbed quite a ways up the trail it joined one of the main trails that meander through the park. A short distance down the main trail we took this picture in front of another “short cut” trail that headed directly down toward the Observatory. These short cut trails, like the one we came up are very steep and we had decided on the way up to not try to descend on the same trail. We were pretty sure we would end up sliding not hiking down it. For the same reason we decided to avoid this short cut trail, stay on the main trail, and enjoy the scenery. The views were terrific. There was a little haze but not that bad for LA. I would love to do this hike after a nice rain when the skies are completely clear. I took lots of pictures, but these two were from my favorite angle. 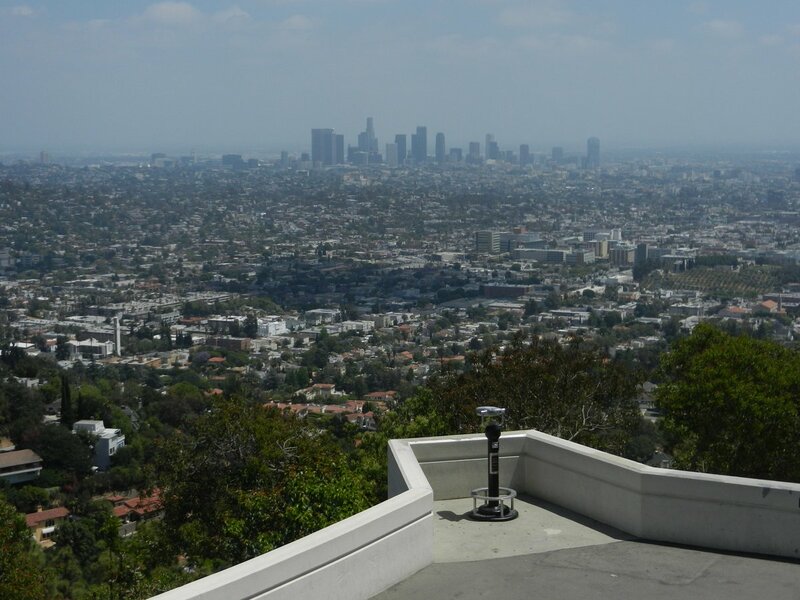 The Griffith Observatory has the LA cityscape in the background. Eventually the trail led us to the observatory. Although the Observatory was built in the 1930’s it is in terrific shape. It was renovated recently, so I’m not sure what it looked like before the renovation. Now it looks almost new… except they don’t build things this well anymore. The observatory is not designed for scientific use, it is designed to expose regular folks to space observation. The dome on the left has a 12 inch telescope and the dome on the right is designed for studying the sun. The large dome in the middle is a planetarium, with regular shows. By the way, the planetarium shows are the only thing that they charge for. Everything else is completely free. This is a view from the roof of the Observatory. You have views in every directions! 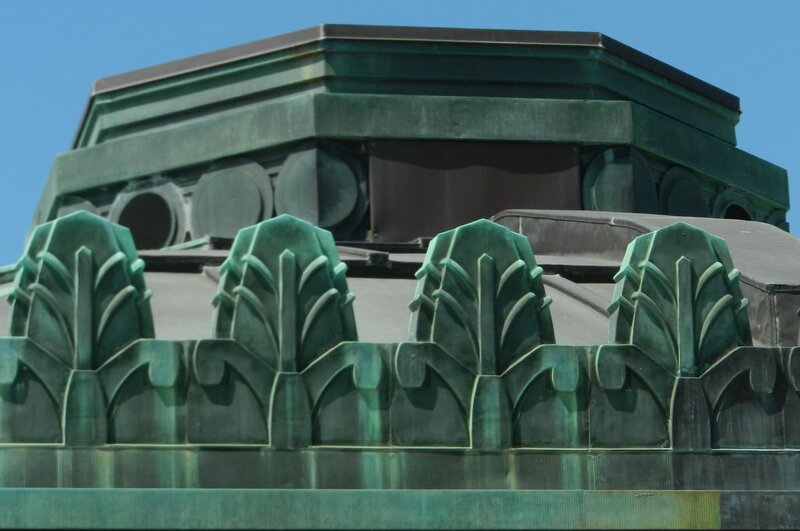 Here’s an example of some to the details in the construction of the Griffith Observatory. I love the Art Deco style of the observatory. It was Memorial Day weekend and there was quite a crowd in and around the observatory. We were still able to check it out without too much hassle, but as we finished up our tour around and through the building a very large crowd arrived. Not sure where they all came from… seemed like they had just unloaded several tourist buses at once. We filled our water bottles and headed down the road toward our parked car. This was a lot shorter than the trail and we didn’t have to worry about sliding. For Sunday night we had decided to catch a play at a small playhouse in Beverly Hills, the Beverly Hills Playhouse. It is an upstairs venue and has very limited seating. We got the tickets on Goldstar which not only saved us money, but is much easier to search for an event on a particular day that other sites I’ve used in the past like Theatermania. The play, Years to the Day was a terrific two-man play with one scene. Two old college friends, now in their 40s, meet up for a “face to face”, 4 years to the day they last met (hence the title). The acting was GREAT! The play was funny… intense… dramatic… and full of surprise revelations and things that were not completely revealed. We can’t wait for the sequel! Before the play we had dinner at Si Laa Thai Dining across the street from our hotel and about 8 blocks from the theater. This place rocks. The food was excellent, the service was better than great, and the main dining room was nicely decorated. We will go again if we are in the area. After the play we had a small desert at Al Gelato which is about a block from the playhouse. The service was very good and the small gelatos hit the spot. The pizza at Al Gelato looked like a good choice for dinner too if you want to be really close to the theater. We were still tired from the long Saturday night and the hike so we headed back to the hotel to hit the sack. We planned to get an early start on Memorial day. The next morning we had a light breakfast at the hotel and headed toward Santa Monica Beach. 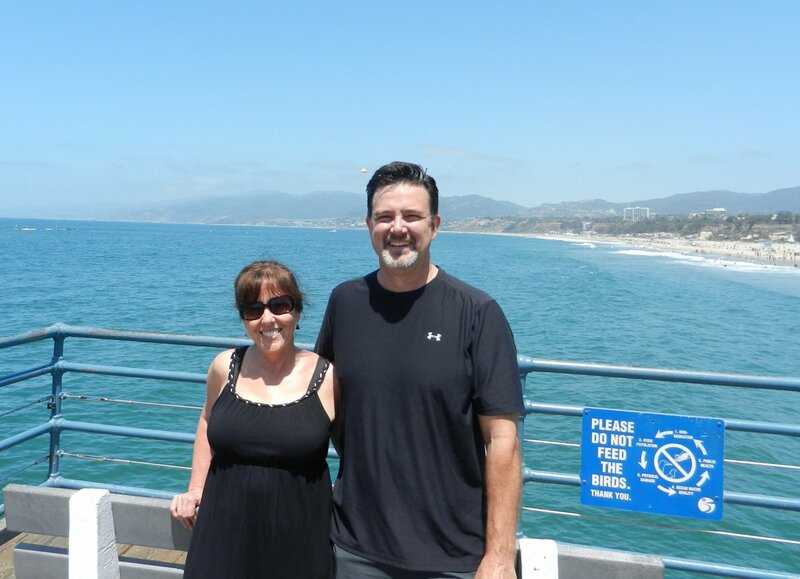 I’m training for the Marine Corps Marathon and was looking forward to a short beach run on Santa Monica Beach boardwalk. This is one of my favorite places and I hate to miss a chance for a visit. The weather was perfect and I had a good run. I wasn’t sure if I was going to run 3 or 4 miles, but thought these flags were a good place to turn around. 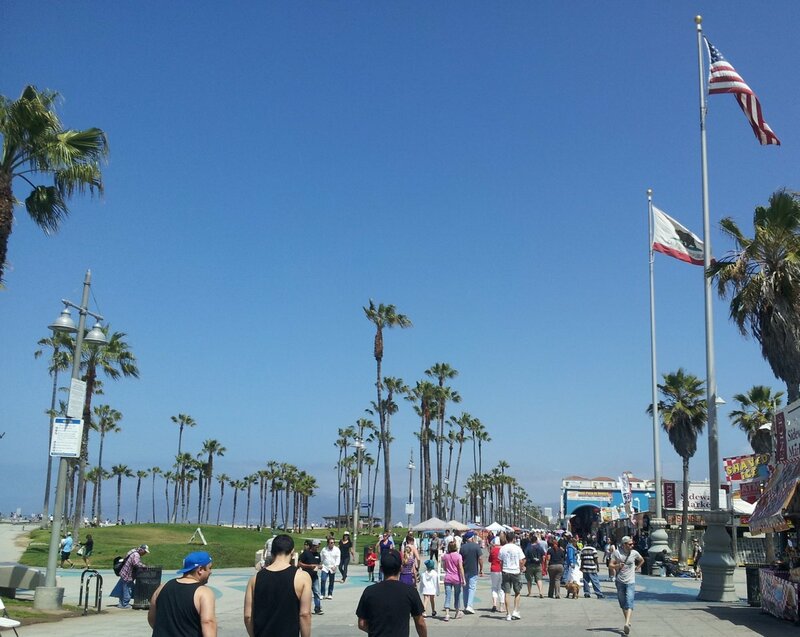 I met my wife back on the pier and we wandered around it for a while, the weather was perfect. Although I was pretty sweaty she let me put my arm around her for this picture. As we left the pier we took our shoes off and hurried across the hot sand to walk at the water’s edge back to our parked car. The first summer weekend at the beach was pretty busy. I thought about jumping into the water, but decided not to get all wet and salty for the drive. It would only be a short drive to my brother-in-laws house for a BBQ and some time in the pool. We had a good visit, but then it was time to head back to the real world… sort of… San Diego and the coming work week… with lots of pictures in the camera to sort through and a post to write – check!